Autumn and her family have settled into their hardware store since the virus outbreak devoured most of humankind. She falls in love with the handsome Leland and adapts to surviving the haunted world outside. Little do they know, a greater sinister force is waiting in the shadows. The growing horde of flesh-eaters will soon be the least of their worries as they save a seemingly helpless young man, Alastor, and allow him into their safe house. But when Alastor appears to be earning the group's trust, he betrays Autumn and takes her away from the group. She becomes his prisoner and learns the truth behind who he truly is. 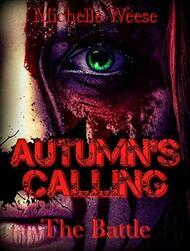 Autumn plummets into a pit of misery that she's convinced she will never return from. A new world is revealed that she never believed existed. She will go to great lengths to ensure her survival from the evil surrounding her. She must escape the man who stole her from her family, no matter the cost.